It's my birthday, so I'm going to the Beer Museum. Which is not actually a museum, but a pub that features 30 or 40 local micro-brewed beers. In Prague. This is fantastic. Thanks to Naomi for the suggestion. I am loving the dark lager, so I ordered a sampler of the first four I found on their extensive list: Opat Chocolate; Platan Merlin; Bernard Cerny Lezak; and Kout Tmavy 18. 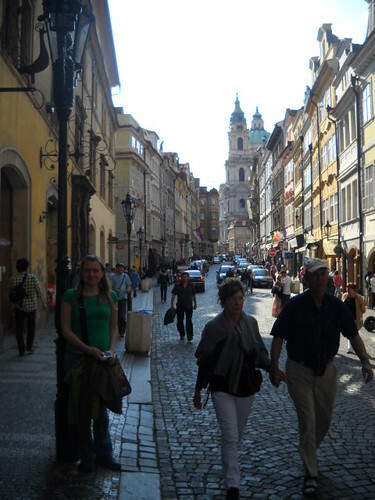 Prague is quite the city of foreigners. I sat next to a local Czech, but he was the only one nearby. Next to him was a guy from England, then a guy from Palo Alto. The bartender was from D.C. But the TV had a game from the Hockey World Championships on, of course. 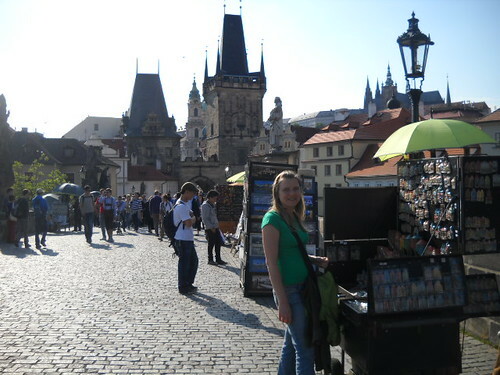 While I was enjoying my time sampling the micro darks, Meghan and her mom were off buying souvenirs on Charles Bridge and sampling the sights.